I have just posted my latest composition entitled 'bees' on the WNO//3 blog site: http://electroclassic.tumblr.com/ or click the link on 'websites' to the right. As I can't post audio here, please visit if you would like to listen to it. The explanation is on the site so I won't replicate. Monday and Tuesday next week are our first sessions with the players. Oh boy can hardly wait. 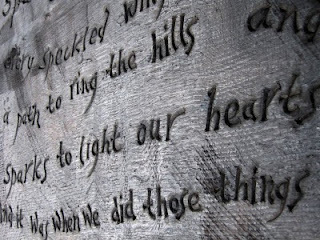 Here is a detail of the lettering once burnt, this will be wire brushed back and teaked oiled. Four strong men will carry to two chunks of oak up to the Motte and Bailey castle and site there. I am carving the words of Gavin Saunders the Neroche Project Manager onto a large piece of oak to create a bench for the top of Castle Neroche on the Blackdown Hills. The above photos have been taken over the last couple of days. 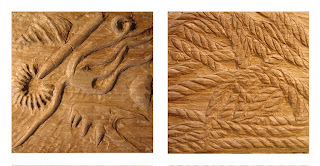 As promised here are the other two carvings for west bay. Again in oak, imagery this time fossils and rope. Okay as promised. 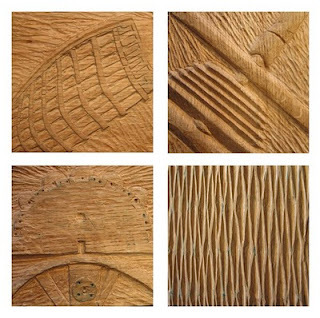 Here are some of the West Bay carvings. 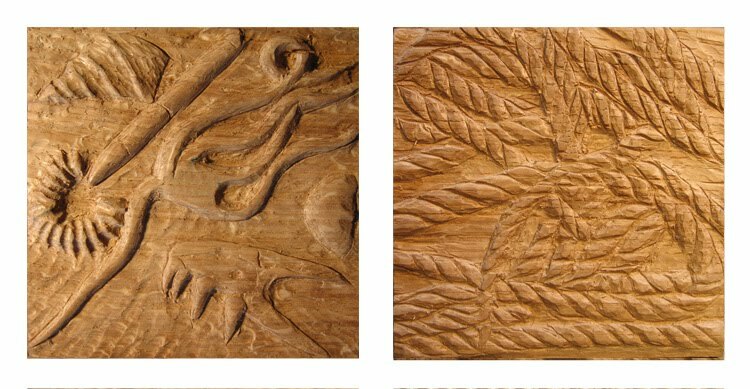 Carved in oak 100mm x 100mm, these are to be cast in bronze at MB foundry in west wales. This is like a diary. the diary that you mean to write in everyday and then 'things' get in the way. Well I have noticed that people have been coming to the site but I have had nothing new for you to see. Not a good advert. West Bay continues, lots of detailing the words with poet Paul Hyland. 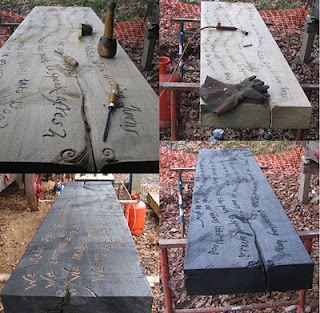 Detailing the stone carving for the central motif with Nick Durnan. Detailing the whole design with Martin Peacock, this all takes time and doesn't necessarily make good blog material. I have now started the carving of the little bronze features and once (maybe tomorrow) I have something to photograph I will post images. We always want something to see. 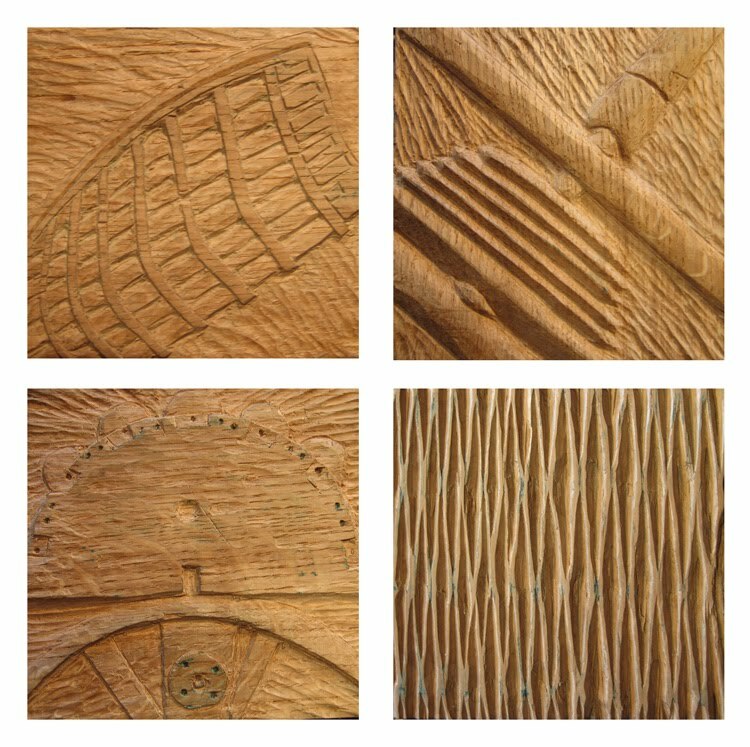 I have downloaded this lot and have been listening to it whilst carving, and yes I did enjoy it.